As a smaller alternative to the Windjammer, the Rycote Softie by Sanken attenuates high wind and atmospheric noises up to 25dB. The Softie is constructed of an acoustic foam base covered by a specially designed synthetic fur fabric together with a separate shockmount with its own bracket and either pistol grip handle or boom adaptor. 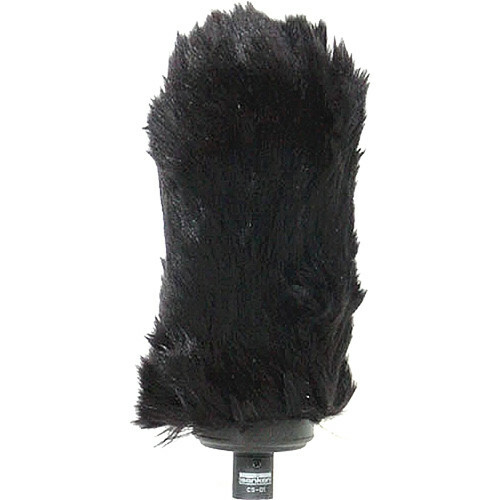 With a thick 10mm coat of fur, this microphone wind protector provides a fast, flexible and cost effective solution for ENG on camera microphones. The Softie is compatible with most on-camera microphone sizes. The special design fits most on-camera microphones. Closely cropped dark grey synthetic fur, just 10mm high, offers lower profile and a more compact design without severely altering the efficiency of the Softie. The Softie eliminates up to 25dB of background and wind noises. Box Dimensions (LxWxH) 10.5 x 4.0 x 3.2"